"Rachel, quand du seigneur" from La Juive. In the 1980s, St. Martin's Press started a new line of mysteries -- mysteries set in the past in which real historical figures acted as the detectives. That sounded like fun, and it would give me a chance to write about some of my favorite people, the singers from the Metropolitan Opera's second Golden Age. Of course I wanted to choose the biggest star of them all to be my sleuth. But even if I worked at it, I don't think I could come up with a more unlikely detective than Enrico Caruso. Caruso was a bit of a scaredy-cat, and he was too devoted to high living and good times to undertake anything as painstaking as a murder investigation. So how could I turn this lovable, larger-than-life figure into a detective? The answer was obvious. Make it a comic novel. I chose as the book's focal point the world premiere of Giacomo Puccini's La Fanciulla del West at the Met in 1910. In the story, a small-time impresario is murdered, and all the evidence points to Puccini. 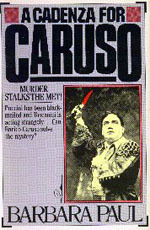 Caruso is outraged that the composer should fall under suspicion and sets out to prove his friend innocent. Undeterred by objectivity or patience, the tenor proceeds to make a thorough pest of himself backstage with his poking and prying and asking of impertinent questions. Alas, I had to cheat on factual accuracy a little to make the story work. For instance, Puccini never did learn to speak English. His communicating with his American stage director (David Belasco) was all done through an interpreter. But you can see how clumsy that would be in a novel, to have so much of the dialogue filtered through a third person. So I gave Puccini an extensive enough understanding of English for him to get by without the aid of a translator. But the picture of the times is as accurate as I could make it. I checked to see when "taximetre cabs" first appeared on the streets of New York, that sort of thing. And I immersed myself completely in the grand and glorious pre-war days of the Metropolitan Opera, the likes of which we will never see again. "A Cadenza for Caruso is a vivid excursion into an earlier New York and grand opera's last Golden Age. This book surpasses several full-length biographies in its portrayal of Caruso's daily life and personal foibles -- his native charm and generosity, his talent as a caricaturist, his predeliction for practical jokes, his love of clothes and good food." "Barbara Paul transports us over the footlights of the Metropolitan Opera and introduces us to 'Rico' the man, a somewhat pompous and self-centered genius who, nonetheless, has a heart as big as his magnificent tenor voice....Author Paul takes a delightfully light-hearted look behind the scenes of a new opera's preparation." "A thoroughly delightful mystery....Paul captures the characters of Caruso and his friends in her wry and occasionally hilarious narration. Well-placed historical details make turn-of-the-century New York spring to life, and Paul's knowledge of the music world adds authenticity. You don't have to be an opera fan to enjoy this caper." "The charm of this mystery is in the authenticity of the portrayal of the period and its early 20th-century people. Caruso is a full-blown character, lovable, impulsive, self-centered, generous, larger-than-life. It's easy to see how he was adored by opera buffs and the public in general....The book is a charming evocation of a long-gone, but not forgotten, golden period in the history of opera in this country." Page created June 27, 1995; last updated June 8, 2000.